B 787-8 TP-01 XC-MEX "José Ma. 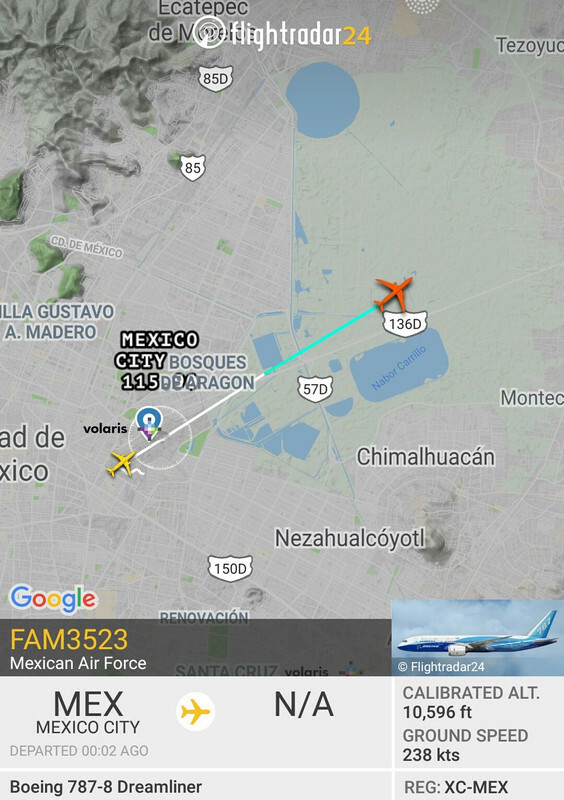 Morelos y Pavón" is being flown right now to VCV for storage and sale. Its last mission was to fly the Mexico's delegation to Buenos Aires for this past weekend's G20. Mexico's new president has pledged austerity and one of the casualties is the 787. Do they have an A310. I'm sure Germany could use it since their Airbus A340 keeps breaking down. I have my doubts whether or not this plane will attract much interest on the second hand VIP market. It is highly customized as a presidential transport. meaning any re-conversion is bound to be rather expensive. And as the 6th 787 off the production line, this is one of the "terrible teens" 787s, with their known issues with weight. Perhaps it will be a write off. Jimmy Carter stripped down and reappointed the SAM27000 to an “austere” level at some expense. I wonder how much this move will cost Mexico in the end. Could be a nice pickup for the USAF as Vice-Presidential or Cabinet transport. It's already configured for government use, and President Trump would be able to hype up a good deal. Of course, the modifications made to this 787 may not meet the standards set by the USAF and it may therefore require further work. Aside from that; the sale of this aircraft is a short-sighted move to please his base. The weight issue is rather meaningless for VIP operators. This is a PR move IMO. It will be listed for sale and pulled from use. The price will likely not be favorable. It will sit, and eventually a future administration will put it back into use. If it is sold, it will be to a leader of a developing country who wants to show up to UN events in a fancy airplane. The fact that it's LN 6 really doesn't matter here, because it can easily handle VIP payloads, and utilization will be low enough that fuel and maintenance won't be substantially higher than they would for any other 787. Believe it or not he is actually flying commercial airlines, yesterday he flew to Veracruz on AM or Aeromar not sure. It will sit, and eventually a future administration will put it back into use. I don't have a source but I believe this aircraft was especially expensive because it was purchased as part of a package that included maintenance and upgrades etc for a period of 20 years or so. Maybe cutting their losses now any avoiding the expensive annual payments is the plan? I'm sure some airline will pick it up. There's quite a wait list for a 787. And I'm sure this one has minimal time used on it. Remind me to send a thank you note to Mr. Boeing. This would not be a good frame to integrate into an airline fleet. It's overweight, restricted to a lower MTOW than production frames, and will be different from later production frames from a maintenance standpoint. If there is a buyer, it's a VIP operator, probably a governmental one given how this aircraft is already equipped. I'm curious to know what their asking price is. That will determine whether it sits or sells rather quickly. If he's serious about austerity and is looking for a means to bring in money that can be better used elsewhere, he "might" let it go for an appealing price. Somebody's new corporate jet, perhaps? Being that the new president just burned upwards $6B USD by canceling the new Mexico city airport just so that one of his cronies can build a different airport, I'm pretty sure he will apply a huge discount to the 787 to whomever gives him an appropriate bribe. This Peje-Lizard President is quite a lunatic. Ridiculous corrupt media spin on this floating all over social media now... "Mexico president *REFUSES* to pay for very expensive Boeing jet" - etc etc etc. *cue pictures of him flying commercial* ...everyone cheers. They went up to Boeing, sorted out the details, agreed to the price, Boeing built the thing - and now when it comes time to pay up, we're going to do a 180 AND make it Boeing / USA's fault for trying gauge Mexico... as a country?! It's just insane - fly commercial all you want, but why waste everyone's time with this fiasco? The basic airframe seems to be on a 15 year lease. So The contract must have "worked" for 3 years already? I'll defer to others that know more about this - but perhaps a part of the deal was the fact that the airframe needs to be built before modifications for VIP/presidential stuff can begin - presumably a few years ago. If she's done and ready to be accepted, then it's still just a huge PR stunt and not really fair to anyone else involved. To be fair, the new president was not involved in the previous administrations leasing and outfitting the plane. and as we have learned here, an incoming president can and does make policy changes that undo the previous administrations efforts. So he doesn't feel the expense is worth the status symbol, good for him. The airframe has been operational since Dez 2015. first in office use beginning of 2016. Did she put in for official VIP mods a while ago when staff changed? Now that it's ready the new staff just decided it would be a good idea to say the entire thing is too expensive now? Even though as you state, it's been paid for many times along the way and everyone knew exactly what they were getting and how much it cost. 'We are selling all the planes and helicopters that the corrupt politicians used,' President Andres Manuel Lopez Obrador told a rally in Xalapa, Veracruz, near the end of his first full day as president. Again - that's cute and all, except you bought it soooo.. If there is a buyer, it's a VIP operator, probably a governmental one given how this aircraft is already equipped.